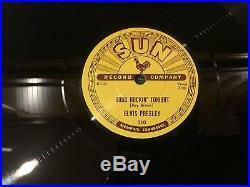 RARE 5 X 78RPM SUN LABEL VINYL ELVIS PRESLEY. 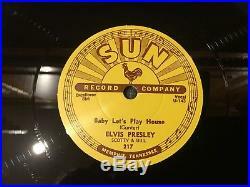 ELVIS FIRST FIVE SUN RECORDINGS BRAND NEW AND UNPLAYED. 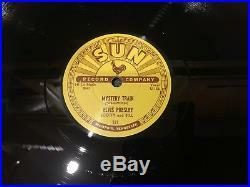 SIDE ONE - MYSTERY TRAIN. SIDE TWO - I FORGOT TO REMEMBER. 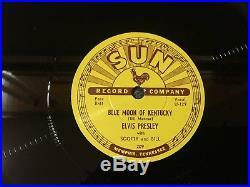 SIDE ONE - BLUE MOON OF KENTUCKY. SIDE TWO - THAT'S ALL RIGHT. SIDE ONE - BABY LET'S PLAY HOUSE. SIDE TWO - I'M LEFT YOU'RE RIGHT SHE'S GONE. SIDE ONE - MILKCOW BLUES BOOGIE. 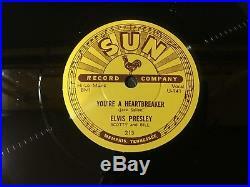 SIDE TWO - YOU'RE A HEARTBREAKER. SIDE ONE - GOOD ROCKIN' TONIGHT. 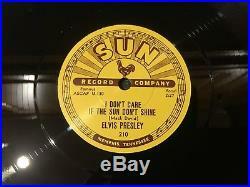 SIDE TWO - I DON'T CARE IF THE SUN DON'T SHINE. 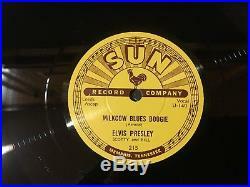 PLEASE NOTE ALL RECORDS ARE GRADED HOW THEY LOOK AND HOW THEY PLAY. 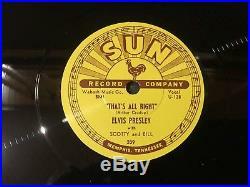 THESE SUN LABEL 78RPM RECORDS ARE MINT AND UNPLAYED ALL RECORDS ARE POSTED IN SPECIALLY MADE BOXES TO PREVENT BREAKAGES. 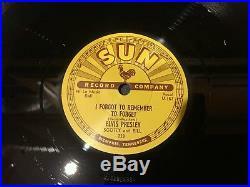 The item "ELVIS PRESLEY SUN OFFICIAL 5 X 78 VINYL RELEASE BRAND NEW UNPLAYED MINT" is in sale since Monday, October 09, 2017. 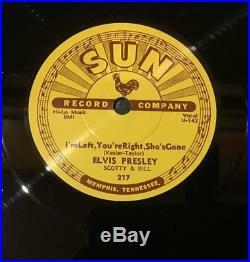 This item is in the category "Music\Records\78 RPM". The seller is "shellacworld" and is located in Castleton / Rochdale, Greater Manchester. This item can be shipped worldwide.